KSG Borbetomagus Worms-West is a Hattrick football club from Worms, Germany. KSG stands for "Kultur- und Sportgemeinschaft" (engl. : Society for Culture and Sports). The name Borbetomagus derives from the Celtic name for the city of Worms, which meant "field at the Borbeta". 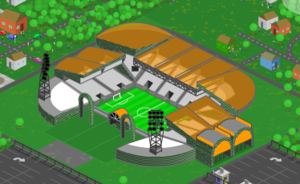 The club's home is the Vangionenarena am Borbeta (engl. : Vangiones Arena at the Borbeta). It is located near the Pfrimm-Park between Pfiffligheim and Hochheim (German links). The former coat of Arms depicted symbols of Worms-Pfiffligheim and Worms-Hochheim (the helmet of their CoA); however, in season 48 the cooperation with the suburb of Hochheim ended and the club was seated in the west part of the central city and Pfiffligheim from thereon. The circle with the implied crosslines and its green colour refer to the celtic history of the city Worms, as well as the orange line in the background. Green and orange are exactly the same colours as defined by the Republic of Ireland for their flag. 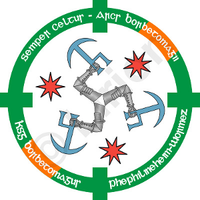 The symbols in the circle are the blue "Wolfssense" (wolfsscythe) adn the red star of the Coat of Arms of Pfiffligheimas well as armoured arms forming a celtic triskelion. The home jerseys and the colours of the circle of the KSG's coat of arms are a reference to the relation of club and city to Celtic ancestry and symbols. The combination white-red-blue again are a combination of Pfiffligheim's and Worms' colours. Both can be found regularly among the club's fans. The club's history began as successor to the 1. FC Lungenkrebs in the X.4010 league of Germany. The team entered the competition ranked 2nd, runners-up to ASV Waldsassen with a margin of 3 points; 2 games remained until the season was complete. In the final match they would meet their direct competitor. * In Season 42, the KSG Borbetomagus were successor to the 1. FC Lungenkrebs, so the first line indicates all results accumulated and the second one those of the KSGB. Top scorers are calculated through the KSGB matches only. Was inducted in the Hall of Fame at age 23 in April 2, 2012. One of the first defenders and, like Konrad Holt, originating from the players from the local suburbs who were suggested to the team on its foundation. Known for offensive-style defending. Decided to stay with the team even without playing anymore - he took over leadership in the young PR team on 1/47. Was inducted in the Hall of Fame at age 24 in October 30, 2011. 3 !WB 5 Spain ! This page was last edited on 27 May 2013, at 18:52.